Biography and accomplishments or why Djoser was famous: He was a great military commander, a warrior king who waged successful wars against the inhabitants of the Sinai Peninsula. 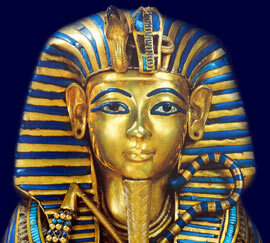 He increased the wealth of Egypt by the mining of Turquoise and other precious gems and metals. Monuments: The Step Pyramid of King Djoser at Saqqara. The man who built the Step pyramid was the vizier of Djoser called Imhotep. Imhotep achieved such a high position that he was later deified and regarded as the Son of Ptah, the Lord of all Builders. Scribes began a tradition of sprinkling a drop from their water bowl in honor of Imhotep whenever they started work. The signature of Imhotep can still be read today in the Egyptian Museum in Cairo on the base of a statue of King Djoser. Each section of this Ancient Egyptian website addresses all topics and provides interesting facts and information about the Golden Age of Pharaohs and of Djoser. The Sitemap provides full details of all of the information and facts provided about the fascinating subject of the Ancient Egyptian Kings - their life, family, reign, dynasty, important dates and events and accomplishments.